Cookie specializes in the use of Redken coloring products, a leader hair care products because of the "Scientific Approach to Beauty" that they pioneered with their protein based products. They are very long lasting and look quite natural. 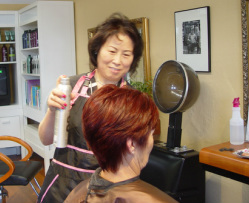 Make sure and discuss your hair color needs with Cookie during your free in-chair consultation. Your hair color says so much about you and can help you feel and look your best. There are literally endless possibilities. You can do anything from a slight change of your natural color to making a bold statement. You can make a change for the season, or add in some anti-aging color to cover some of that pesky grey. Think of hair as your most important cosmetic that color will enrich and liven up or take on a subtle and understated position. Cookie works with Redken Color Gels for permanent color. Choose from 50 shades in 10 tonal families. Redken Color Gels can be used to create highlights or color effects, and they provide thorough gray coverage. Cookie offers Redken Shades EQ. This is an ammonia-free Semi- permanent hair color that Cookie uses to enrich natural color, refresh faded color and tone highlighted hair. Any Semi-permanent hair color product such as Redken Shades EQ is not designed for lightening hair by itself, rather it is ideal for boosting color, shine and condition to both natural and color-treated hair. Cookie offers Redken Color Gels for permanent color. Choose from 50 shades in 10 tonal families. Cookie uses Redken Shades EQ, an amonia-free demi-color, to boost color, add shine and condition. 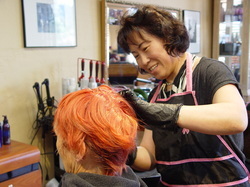 Give Cookie a call today to schedule a color service. Cookie offers highlight and lowlight service using the same Redken color products that she uses in base coloring for a consistent look. Both services are recommended for a stunning look that has great depth. Keep that great look even longer with Cookie's hair care products for the home. You don't want that great color to wash down the drain, and harsh shampoos and hot water are just the thing for that. Wait at least 48 hours after the color service before washing your hair. When you do shampoo, use a professional product. Cookie carries several lines designed to preserve and protect your hair and it's new color! And men ... don't forget yourself! You can add excitement to your style and enhance your look. Just get with Cookie!